Easily and quickly edit MP3 or AAC files. Is there a better alternative to Macsome Audio Editor? Is Macsome Audio Editor really the best app in Audio category? Will Macsome Audio Editor work good on macOS 10.13.4? Macsome Audio Editor needs a rating. Be the first to rate this app and get the discussion started! Macsome Audio Editor is a powerful audio editor freeware that supports easily and quickly editing MP3 or AAC on Mac OS X. 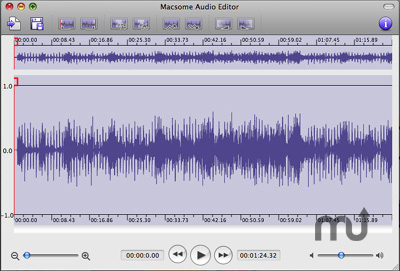 With Macsome AudioEditor, you can quickly cut and trim audio, as well as split files. It works with compressed MP3 and AAC formats to edit without the quality loss caused by other editors. Get perfect quality audio when editing natively in the MP3, AAC formats. You can also use it to make Ringtons for iPhone, or any other phone which support MP3 or AAC file as its ringtone. And you can also use it to remove any unwanted part or ads from audio files. You can add ID Tags for the audio file you saved to disk. ID Tags including Song Name, Artist, Album Name, etc. The most of all , it is a freeware, free to use software, free to upgrade.